"The stock market is officially in a correction... here's what usually happens next"
The recent stock market declines have taken the S&P 500 into correction territory for the first time in two years. It is important to understand the history of stock market declines and bear markets to learn that after every correction U.S. stock market investors who "stayed the course" have portfolios larger than before. "Stay the course" is not the same as "Buy and hold." Corrections and bear markets can often be an opportunity to rebalance, sell an unwanted fund, tax-loss harvest or move to another company. Last edited by Taylor Larimore on Thu Feb 08, 2018 10:42 pm, edited 1 time in total. Re: "The stock market is officially in a correction... here's what usually happens next"
A drawdown/recovery time table in real dollars with dividends reinvested would satisfy the curiosity a little better, if someone has a link or personal project. I count 36 > 10% drops. For 19 of them the drops are in the 10-15% range. So about half the time this is a great buying opportunity to make 10-15% in 1-9 months. THe other half it is a great opportunity to lose another 5-40%:) As it is we are looking an event that happens every couple of years and figuring out if it is going to turn into an every 10 year(or 20 year) event or not is like reading tea leaves. And you will have no way to tell until the end. The list periods like Oct 07-March 09 as one big event. But along the way there numerous 5%+ rallys. You can look at some people saying the worst was over after the Obama election ralley (~15% from middle of Nov to dec) and then even more people talking about in March about how not to get fooled by the rally cause the markets still had another 30% to fall. Vanguard home page has this article right next to the login button to help educate investors. Making sudden changes to your portfolio could lead to costly mistakes. See our research and tips. Certainly the numbers don't mean anything about the future. It's just that whenever I gawk at number fiddlers, I prefer them to be using instruments of real total returns. The past is the best predictor of the past. I'm going to keep buying every Monday, as always. If the market is in a correction that implies the market was previously incorrect. So why were all the geniuses out there buying stocks? The term "correction" is just broker babble to justify ignorance. The market is nether correct nor incorrect; it is what it is. So anything can happen next. As I did in 08-09 just keep putting money in it as I can. Says who? Mr. Potato Head? Pfff. Every Friday our automatic investments happen. Nothing will change with the auto investing. I have a pile of cash (about 200k remaining) that I was DCA'ing into my robo-advisor taxable account, first week of each month - so I just did that (50k) Monday. I'm trying to decide if I should not wait until the first week of March for the next tranche and instead dump another 50k in now. What usually happens next is a lot of hyperventilating. Even on this board, though to a lesser extent. Ten years from now it will look like a good buy either way. Back to mid-December levels. Yawn. LOL, apparently there is a MrPotatoHead and a mrpotatoheadsays, two different user ids. I want to thank you again for the guidance I received from you, Mel, and Bob Stowe in October 2001, when I came to Morningstar Vanguard Diehards. The dot-com bubble had just popped, I was out of work and my 401(k) was depleted due to high Lucent stock holdings. I asked a specific question, but instead of answering it, you, Mel, and Bob have guided me through the principles of developing a strategy and staying the course. You frequently say that you live in a house that Jack has built. Similarly, I am now enjoying retirement that you, Mel, and Bob have masterminded for me. Declines, corrections, recessions, and other market declines tend to focus our attention on the investing essentials. Let this decline bring attention of numerous readers of this site to your ageless advice and serve them well in the long run. I don't wanna get between the two of you if you have a disagreement! You know, I see the correction happening, and I am marveling at how my 'psychological' reaction has changed, as a result of finding this site three years ago. Seriously, it is night and day. I think having this forum is very, very helpful in controlling the behavioral aspect of investing. Five years ago, I would have looked at a 10% decline in my piddly portfolio with bug eyes. Here I am this morning, five years later, sipping my coffee, and saying, "Woohoo....index funds just went on sale. Time to go get me some!" Who can know the future, but if you're playing the odds, the odds favor the market increasing as opposed to decreasing for the year. 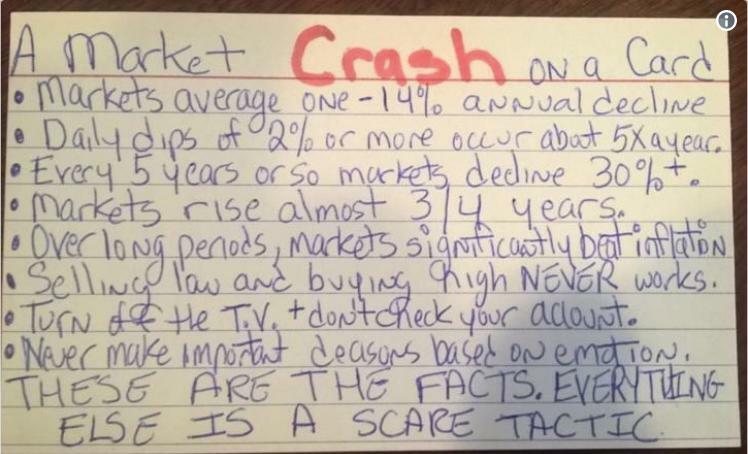 Larry Swedroe write a great article about this two years ago (when the market corrected in 2016). I highly recommend it. Staying the course Zero concern about the market. Continuing with my investment plan (DCA to max out my 401k and our IRAs over the course of the year). Don't put too much "stock" in the word "correction." A "correction" having occurred does not mean the market was "incorrect." The market is the market - and is therefore (by definition) always correct. It always reflects the price levels that investors (in aggregate) believe the market is worth. Of course, the "average" correction only involves a moderate decline and lasts a short time. If it were worse, it would be a bear market. The entire factual content of the article is "big drops don't happen as often as small drops." But it is gussied up with rhetoric that suggests something more reassuring. The fact that we can say today that we are in a "correction" is not predictive. It tells us nothing at all about whether, after it is over, we will be calling it a "correction," a "bear market," or a "secular bear market." Staying the course is hard, and we have to be prepared to do it through declines of all sizes. Saying "we are in a correction, corrections don't usually last very long" may be the wrong advice. 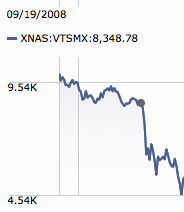 In September of 2008 we were "in a correction." For the record, I think what is happening now, this time is just a correction. But don't bet a dime on my feelings, because that's what I thought in 2008! My asset allocation is based on the possibility of a 50% drop, even though I do not expect to see another one in my lifetime. Sometimes you don't think disaster is coming, and it isn't. Sometimes you don't, and it is. Sometimes you do, and it isn't. Sometimes you do, and it is. "Gentlemen, you have come 60 days too late. The Depression is over." --Herbert Hoover, June, 1930. Immortal words of Mr. Bogle goes something like this in times like this: When everyone is doing something stand there and do nothing. Good advice for times like this. Thurston Howell the 3rd on Gilligan's Island gets a telephone. He calls his stock broker. Something, something, fearful or greedy. I appreciate your message more than you know. It's amazing to me how my reaction to market corrections / bear markets has changed since I signed up for this board. Thanks to the guidance from the forum, the IPS, an AA I can live with, the rebalance bands, a conservative SWR, etc. downturns illicit a casual look see. Thank you for your sage advice. I had just rebalanced in early Jan. with some substantial new cash and was deciding whether I should be regretting something . But, according to "Bogle Basics", there's nothing to get upset about. Think I'm going to make a couple of these. Agree 100%. And being in retirement with no income outside of my investments, this attitude is more important than ever. I put about 30k in my portfolio mid January (about 30% of my total taxable investment), wasn't a great timing! I still have cash that I plan to invest (about 75k). What would you do? Lump sum now or DCA over the next few weeks? I’ve seen this movie before and I know how it turns out. This (may) is a good example of why "waiting for the drop" is still futile. VTSAX is down about 10% but still only down to the value of Mid Nov 2017. So if this was all available then you'd still be in the exact same position as if you bought all in at that time. DCA'ing has actually raised the cost of buying into the market during that time since between Mid Nov and just before prices started dropping you were gradually paying more. Stay the course, stick to your plan. See how insignificant "Black Monday" vanishes in the long term? Funny thing. After spending time on this board I feel an incredible amount better about the changes I made to my assets pre-correction. I'm even more confident in those changes I made to have the ability to ride out this current situation, and, one might hope, to engage in purchasing opportunities. That said? When should I start worrying about over confidence affecting my judgment? I've wanted to ask this question before. Isn't it market timing to use situations like these as an opportunity to rebalance? In my case, I was a bit stock heavy and thinking of rebalancing some to bonds. Now seems like a bad time to do that, as the market has mostly done it for me. I want to know how the people who invest weekly do it. Is your source of income weekly? I get paid monthly so I invest monthly, nine months a year. In any case, I'll be doing what I be doing. A little over two weeks from now is my next paycheck, and with it, a retirement account contribution and a non-tax-advantaged account contribution. Yeah, what if they BOTH put in their angry eyes at the same time??? I looked at my balance around 10:00 AM, and I was up $18,000 for the day. Looked again at 12:30, down $18,000 for the day! I have a hard time believing humans are doing this. But whatevs. I'll be buying more on Monday. No, this time it's different! I wasn't sleeping well last week and didn't sleep at all last Thursday night. The final stages of implementing my IPS to its proper AA required me to sell some equities on Friday last week and then buy different equities on Monday. And now I'm sleeping great. It appears my anxiety was all about getting to where I needed to be. I barely blinked in 2008, although I did notice the drops. Now I have a great plan in place and I am going to follow the advice to "stay the course". The stock market this week just makes me laugh! Rebalancing is not about changing your asset allocation - it's about getting back to your original asset allocation. It's not market-timing, because you are not making any changes based on what you think the market WILL DO, but what it has already done, and again, you're not really making changes. You're just getting back to your original AA. What Taylor is saying is if your desired AA is 50/50, and now after this correction, you find yourself at 45/55 stocks/bonds, this can be good time to sell bonds and buy stocks, and get back to 50/50. But maybe (this sounds like your situation), you were 53/47 stocks/bonds two weeks ago, after the recent stock run-up, and now the correction has put you at 49/51. In this case, there's nothing to do... You were almost at the point of rebalancing a couple of weeks ago, but the correction has put you back where you want to be anyway. Last edited by HomerJ on Fri Feb 09, 2018 1:37 pm, edited 1 time in total. Okay, I'll admit it. I'm a market timer now. It started in 2009 when I went from 70/30 to 100% equities because they were cheap IMO. Stayed 100/0 until Oct 2017- went to 30/70 because equities are overpriced IMO. When my FB friends were posting their 401k statements online, I went to 20/80. I'll get back in after equities decline 40%. I look at the shenanigans going on in the markets now as someone giving me an insulting lowball offer for my dividend producing stocks and funds (yes,even S&P 500 Index Fund has dividends),as long as I don't have to sell I feel this too shall pass. What will you do if equities don't decline 40%?